The Interpretation Australia National Conference in 2019 will consider the topic of sustainability in interpretation. We will contemplate the importance of telling sustainable stories in a time of global uncertainty and climate change. 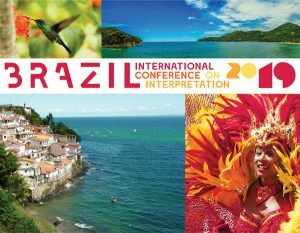 The conference will consider sustainability in interpretation as a method of economic, cultural and social sustainability. Papers will be presented on the topics of sustainability of practice, of the environment, of story, of community, of heritage, and of culture. The conference is aiming to be low/zero waste, with initiatives such as BYO lanyard, pen and notepad. We are aiming to have no printed programs or single use items, with all material to be recycled at the end of the conference. Registrations for the 2019 National Event will open in May. We are also seeking Melbourne-based organisations would be happy to host a field trip on Friday afternoon as part of the official conference program. We would prefer venues on the metropolitan transport system as delegates will be travelling via public transport. Interested in becoming a partner or sponsor for this years Conference? We are seeking businesses and organisations to partner with us for a variety of sponsorship opportunities for this years event. For more information please follow this link.